How do you describe No Passport Required? No Passport Required is a journey across six American cities where in each stop we go deep into the heart of a local immigrant community. Through food, I learn about the traditions and culture of these communities that make this nation so rich and dynamic. It’s not just about where or what to eat but how people come together around food — that common thread that links us all and defines us, too. Why did you want to be part of this show? What do you hope it brings into the world? As an immigrant myself [born in Ethiopia, raised in Sweden, and now living in Harlem] it is a dream to be a part of a show that shines light on the food culture of immigrant communities all around us. I love nothing more that heading to a new city and making my way to a local market or being invited into a family home for dinner. My hope is that the program helps show people how similar we all are — something that I think is incredibly important in our current climate. Through these moments we’ve captured, it’s my hope that people feel connected and invited into a community they may not know. If you could narrow it down to your one favorite moment — what was that and why? It’s hard to pick just one moment. It’s all the incredible storytellers we met who made the show what it is. A couple of examples of some standout moments are cooking with Tung Nguyen’s family in New Orleans and making kibbeh with Nahdie in Detroit. I love both Vietnamese and Middle Eastern cuisines, and I hadn’t had a chance to really cook them in a truly authentic way before. Above all, this show would be nothing without all the people who shared their wonderful stories with me, and I can’t wait for everyone to see this journey. 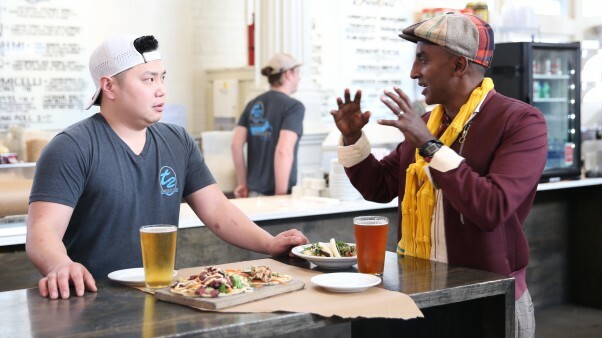 Chef Tung Nguyen (left) with Marcus Samuelsson at Nguyen’s food stand in the St. Roch Market in New Orleans. Can you share something new that you learned that truly surprised or shocked you? I don’t think I fully realized​ the extent of the sacrifices that some of these people make. So many of the stories are super powerful and humbling to hear. All of these people are so patriotic and really want to work hard and give back to their communities and hopefully this show will highlight that. When I think about this moment we’re in, I have these stories in my head. After all, at the end of the day we’re all immigrants. It’s impossible to create such a show without addressing industry legend Anthony Bourdain, the chef and TV host who died recently. Did he have an influence on you? Absolutely. I don’t think you can underestimate the impact Tony had showing the world how closely linked food, culture, and identity are. Our friendship meant a great deal to me and all of us in the chef community are still grieving. I was excited to tell him about the show early on and grateful for his support. I will never forget the amazing time we had together in Ethiopia with my wife Maya — it was a powerful journey that I will carry with me always. This interview originally appeared on Eater.com.